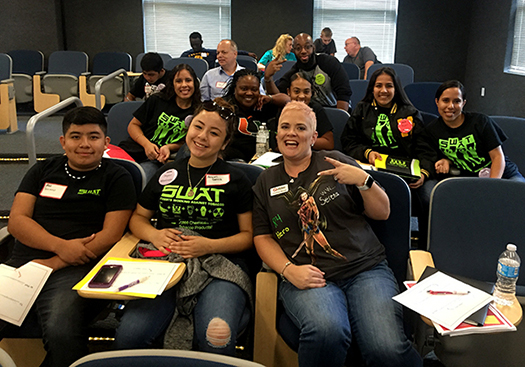 SWAT Coordinator Courtney Moyett and two of her SWAT Club student leaders from Okeechobee High School attended the Region 4 SWAT Training on October 14, 2017 at Kaiser University in Port Saint Lucie. 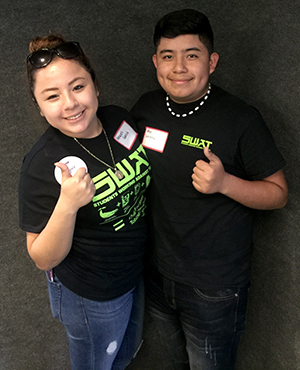 Local youth leaders Alex Soriano and Araceli Garcia, attended the training, each bringing their own unique perspective to the day’s activities. During the training, they developed and presented their “why” statements, sharing what drives them to stay tobacco-free and help take down the tobacco industry. One of the day’s sessions included an in-depth look at e-cigarettes, and some of the myths and dangers associated with these projects. The attendees created a message quilt with many of the common misperceptions surrounding e-cigarette use among youth in Florida. During a brainstorming session, SWAT youth came up with a list of priorities and messages to communicate to other youth and to help prevent the use of e-cigarette products by their peers. The Okeechobee County SWAT Youth in attendance left the training armed with resources and ideas to bring back to the county level to better counteract tobacco use among youth in our community. For more information on local youth tobacco prevention efforts, visit www.swatflorida.com or contact Courtney Moyett, Okeechobee County's Tobacco Prevention Specialist, at CMoyett@QuitDoc.com.